Unroll 1 can-8 oz of crescent dinner rolls into 4 rectangles & cut each lengthwise into 10 pieces. Cut 2-1/2 slices of cheese into 4 pieces. Wrap 4 pieces of dough and a strip of cheese around each hot dog to look like bandages. Make sure to leave room for the face. 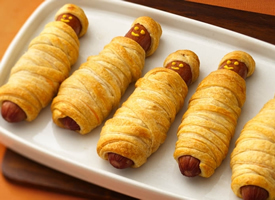 Place Mummy Dogs on a baking sheet coated with cooking spray. Bake at 375 degrees for about 16 minutes. Make eyes with Mustard.